This week's floods in North India have once again highlighted the inability of our civilian administration to cope with disasters. Each time, the military gets called out to rescue stranded civilians and repair broken roads and bridges. Of course, the Indian military isn't unique in this regard. From China to the US, armed forces are ordered to assist civilian authorities during major natural disasters. We saw this with the Sichuan earthquake and during Hurricane Katrina. But in India, the military has become our default option for disasters great and small, when it should be no more than a back-up. This seriously undermines military readiness, because we have now established a predictable pattern, which can be exploited by the enemy. Here is an entirely plausible scenario based on events that have occurred in the past. The People's Liberation Army is planning an assault to capture Arunachal Pradesh. However, India's two new mountain divisions in the region are a major roadblock. It needs to somehow distract their attention and limit their ability to respond before the assault so that it can march past the border unhindered. It coincides a major theatre-level "training" operation in Tibet with the rainy season. This allows it to move troops into the region without much suspicion. As the rains fall, the dams that China has been building along its section of the Brahmaputra are filled to bursting point, it begins to open the flood gates. The floodwaters hit Arunachal Pradesh and Assam, washing away villages as well as vital roads and bridges that connect forward areas of the state. With no information on what's causing the flooding, the Indian government orders to army to begin relief operations. Entire battalions are called away from their bases to find survivors and rebuild broken transport links. Indian force levels protecting this front are diminished and the PLA begins its assault. The above situation is not entirely imaginary. 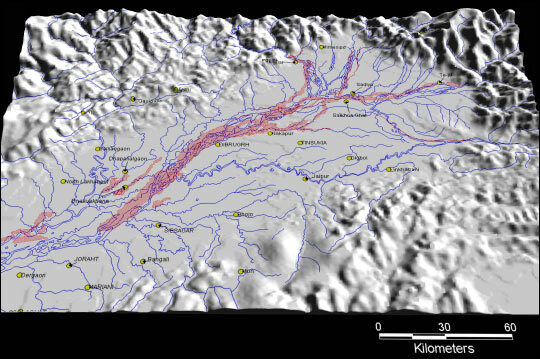 In June 2000, the Brahmaputra river burst its banks causing flash floods in Arunachal Pradesh. (http://news.bbc.co.uk/2/hi/south_asia/867657.stm) 20,000 homes were destroyed and ten people were killed. The flooding washed away villages, roads and bridges, cutting off entire districts. The army and air force were ordered to mount rescue operations in difficult terrain to reach the survivors. Initially, there was little information about what caused the flooding. One month later, it became clear. An AFP report quoted a Chinese official who confirmed that the floodsoccured after a natural dam in Tibet burst. The official worked for the Water Resources Department of the Tibet Autonomous Region government in Lhasa. To make matters worse, Beijing did not inform Indian authorities about the dam breach, nor did it allow the incident to be reported by Chinese media. India was caught unawares as the water rushed towards villages in the north-east. China is currently building 39 dams of varying sizes along the Brahmaputra and its tributaries in Tibet. Ostensibly these are for its water and power projects. India and China have not signed any river treaties, although they have created a joint-working group to share data on the Brahmaputra. That said, China's lack of transparency about its riparian plans in thisregion doesn't seem to be going away any time soon. This has led to grave concern in the Arunachal government. The solutions of course are quite obvious. The National Disaster Response Force needs to get more men, training and equipment. Also, instead of regular army units, which should be manning the front, the government could train and involve the Territorial Army much more in disaster relief operations. The main military force should be a fall-back option at all times in such situations. Unfortunately, by making it the default option, we have severely affected our military preparedness.